Send us your email to be a Backstage Pass VIP member and get exclusive email newsletters about all the Runway RunAway events! VIP members will also get a special free gift with purchase of the book. Phil Collen's daughter Samantha has a VIP Backstage Pass! 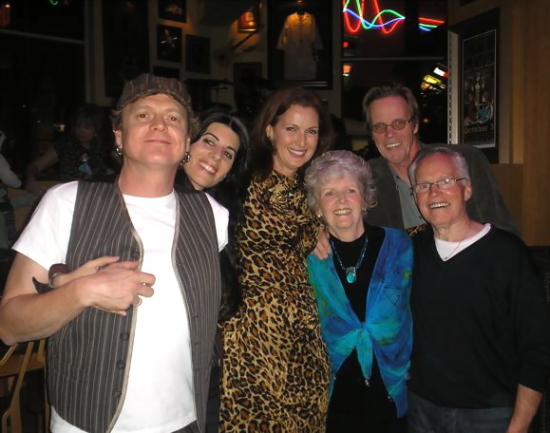 Def Leppard drummer Rick Allen, Lauren Monroe, Lorelei, Rick's darling mum Kath, Siren Star co-publisher Nick Glennie-Smith, and Rick's step-dad Jim at the Hollywood Hard Rock Cafe event Jan. 22nd 2009! Lorelei in vintage YSL couture (the dress she wore with Steve Clark in Vanity Fair) and Rick Allen's mum Kath, a former member of the Fun Police who made an onstage raid of the band in Miami in 1988. Shanna, a happy VIP Backstage Pass reader! The book cover hot on the press - 10/20/2008! check out our fancy paper - 70 lb. matte! The photos look fantastic on this! to make the book look great! 5,000 books roll into the Siren Star shipping garage 10/24/08!